FRISCO, Texas — Communication among drivers, transportation companies and warehouses can smooth the logistics efforts of delivering freight, according to industry experts. Drivers rely on sound information from their dispatchers and their warehouse destinations so that they can plan their journeys well and maximize their time when they arrive. Marcie Delmar, director of customer service for Frozen Food Express Inc., said clear instructions would result in smoother loading operations. 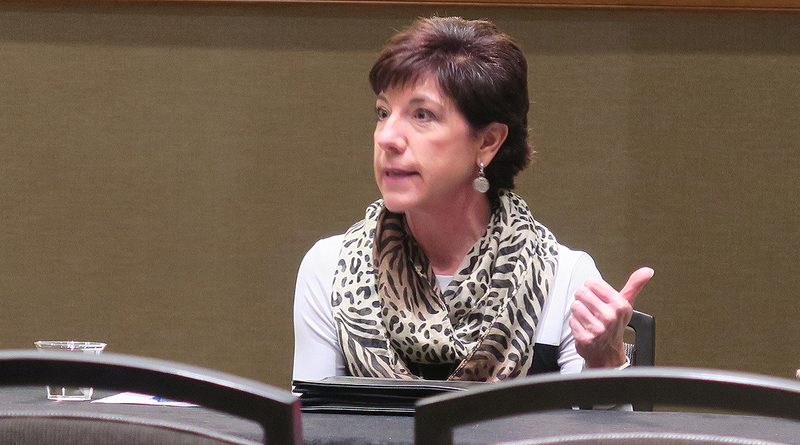 Delmar spoke on a panel at the Women In Trucking Association’s annual conference Nov. 14. Hauling temperature-controlled loads is sensitive work. Frozen Food Express, based just outside of Dallas, specializes in refrigerated trucking. Delmar said that trucks that sit at docks for extended periods of time risk exposing their goods to a change in temperature, which can harm the product. She said Frozen Food Express has incorporated alarms that sound once the temperature in a container reaches a certain degree. Stephanie Klang, an outreach coordinator for CFI, is familiar with the anxiety a driver can feel when trying to deliver a load on time, especially when running up against hours-of-service limits and looking for a place to park. Klang, who began her trucking career in 1980, is a former America’s Road Team captain for American Trucking Associations. HOS rules ranked No. 2 on the American Transportation Research Institute’s list of pressing concerns, released Oct. 29. The lack of available truck parking was No. 5. Most warehouses offer places for trucks to park, but some do not. Klang used the example of one trucker who arrived at a facility five hours early and was forced to park 90 minutes away at the nearest rest stop rather than at the facility. Klang said staging areas, or places where trucks can be left while their drivers are figuring out which dock they need to go to, also would ease operations. Some facilities don’t have enough room for a staging area, forcing drivers to park at docks that may need to be occupied by someone else. Klang said she once arrived at a warehouse at 8 a.m., and the facility didn’t start assigning docks until 9 a.m. Language barriers also can also impede smooth warehousing operations. Delmar said that hiring bilingual workers has eased the process. Amenities at warehousing facilities also are important. Warehouses typically don’t allow drivers on the dock floor for liability reasons, so they provide places for them to go while their shipments are being unloaded. Delmar said that a good warehousing facility will have restrooms with hot water, Wi-Fi and break rooms with snacks and microwaves. Some warehouses, however, have none of these. Klang said she knows of a warehouse in the Dallas area that doesn’t allow drivers to stay on the premises while trucks are being filled or emptied.